The CRP-10A48 design is very similar to the CRP-10772 but uses a more delicate the molding. This door is highly customizable and allows the client the ability to choose: edge profile, framing bead profile, & the panel raise. The “Ogee” framing bead is a Cabinet Joint favorite for this door. 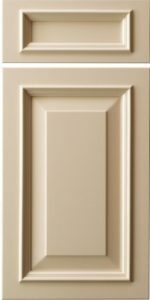 To heighten the popularity of this door specifically for painted finishes, Conestoga (CWS) made this highly customizable door available in full, five-piece MDF construction and called it the CRP-10A48 (MDF).